Whitetail DeerHow Long Do Deer Live? From predation to dumb-luck accidents in the wild, there's a whole list of factors that influence a deer's life span. We break down each to answer the question, how long do deer live? Many variables contribute to a deer’s lifespan and this makes it tough to answer the often-asked question, “how long do deer live?” Some factors include regional homeland, hunting pressure, extreme weather and unforeseen, overlooked death threats. Still, if you’re looking for a good, clean number, without the changing variables to cloud the answer, estimating the lifespan of deer held in captivity is a reliable way to go about it . In the book “The Deer of North America,” whitetail authority Leonard Lee Rue III cites deer that lived for nearly two decades, including a Vermont doe that lived to age 19. Research provided by Quality Deer Management Association reported whitetail does living in captivity for up to 18 years of age, while a handful have been reported to make it to 23 years old. Male deer, however, didn’t fare as well. Only a couple were reported to live beyond 15 years. This gender/lifespan trend is typical of almost every species, including humans. Data published by the United Nations reports that women live nearly five years longer than the average man, with the age gap between life expectancy even greater in some developed countries. But that doesn’t mean hunters should hold out for a 20-year-old seasoned buck unless you have access to an expansive property perfectly manicured for whitetail extravagance. The University of Wisconsin, Stevens Point, College of Natural Resources, breaks down the average lifespan of a wild whitetail. It differs greatly from those living in captivity. The major factor causing shortness in deer lifespan is hunting. You and everyone else in search of their annual venison allotment account for approximately 5.5 million bucks and does ending up in freezers, according to the latest Quality Deer Management Association Whitetail Report. Of course, hunting seasons provide sound management for whitetail populations coast to coast. Without hunting seasons, whitetails could exceed the carrying capacity of the land, be prone to disease and increase collision rates on area highways. The aforementioned occurrence of auto collisions accounts for more than 1 million injured or killed deer annually. Those that survive limp off, possibly to be pursued by area predators. Even healthy deer fall prey to predators such as coyotes, black bear, bobcats and mountain lions. Coyotes currently cause the most predation issues due to their widespread distribution throughout the whitetail range. Expect fawn mortality to increase from coyotes as new research details this problem. One study from the U.S. Forest Service Southern Research Station at the Savannah River Site in South Carolina reported 70 percent total fawn mortality at this site, and coyotes were identified for approximately 80 percent of these mortalities. Mark Kayser found this buck dead while he was bowhunting and could not figure out why the deer died. Disease can break out in nearly any whitetail locale, with epizootic hemorrhagic disease (EHD), chronic wasting disease (CWD) and bovine tuberculosis (BTB) being some of the more prevalent. HD outbreaks vary annually and range from infecting a handful of deer to wiping out 50 percent or more of a region’s population. Fortunately, whitetails rebound quickly to combat any accumulating decline. CWD ranges from as high as 19 percent infected in some mule deer herds to a more common infection rate of 10 percent or less in various whitetail herds. If the infection rate nears 30 percent, however, a herd could not sustain itself. As for BTB, in most areas it is insignificant. Still, it’s monitored closely to ensure it stays that way. Finally, a whitetail’s lifespan could be halted simply from forest accidents. Getting hung up in fences, breaking a leg or getting trapped in the crotch of a tree. 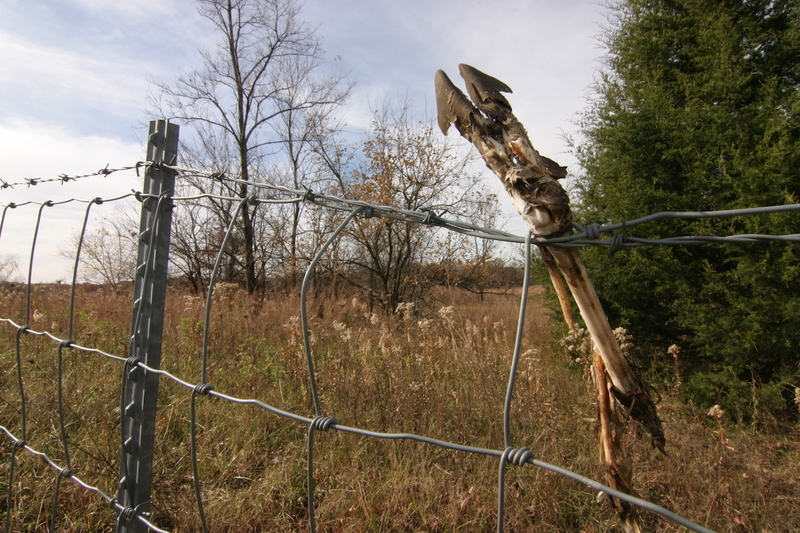 Many other accidental anomalies occur and kill whitetails before their prime. If you’re an avid whitetail buck hunter and hope to shoot the buck of a lifetime, keep in mind that a buck’s lifespan is short. If you tag a buck that was 4½ years of age, know that it exceeded the average lifespan. Any buck you shoot that is older than that is a true trophy to be cherished.